I opted to keep my envelope mailable, but as adorable and cheerful as the card itself. I used a Stampin'Up! 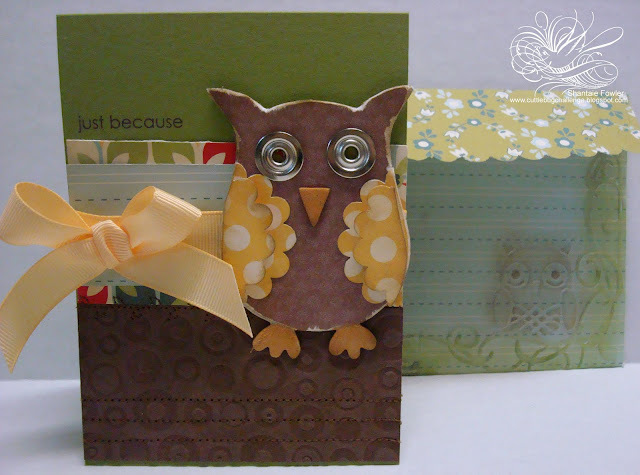 envelope as my template and created this one from Cosmo crickets' girl Friday paper embossed with the owl folder and inked the embossed area to highlight the details. 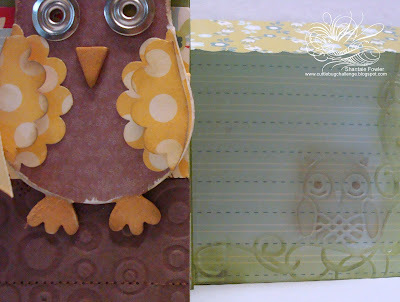 Mr. Owl is a SU chipboard piece from the on board so tweet package. He is covered in patterned papers and sanded lightly, with heavy duty rivets for eyes. I hope you decide to play along this week, There is no limit to the possibilities for decorating an Interesting envelope, give it a try!!! Why not fly on over to see what the rest of our amazing design Team has created for this super fun challenge!!! This really is adorable. I have to try that. I usually place one little stamp, but nothing as beautiful as this.... Thanks for sharing. Hey Shantaie! This rocks! I love his big rivet eyes and especially love the embossed owl on the envelope. Owls, polka dots, and scallops. YUMMY! You are so clever to think to use the owl folder. I do love owls :) Your scallop-y wings are precious. Cuteness abounds here! I love this card so much which is how I found your blog. Wish I had all the supplies to make one now. I don't have the chipboard or rivets for the eyes. Love it. Your envelope is so nice too. I have the owl folder and have never used it. What a hoot~ Nature enthusiasts everywhere would love this.